Marietta Toyota is proud to announce its participation in Toyota’s Rent-A-Car program, which enables Roswell, Atlanta, Vinings, East Cobb, Smyrna, and Marietta drivers to rent a range of exciting new Toyota vehicles. 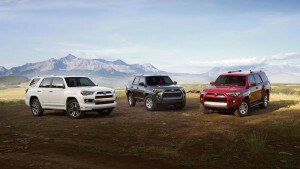 Whether you need your rental for a weekend, an entire week, or longer, we offer competitive rates, excellent customer service, convenience, and a “Try It Before You Buy It” program, which lets you rent a Toyota before buying it, including the new 2019 4Runner SUV. Offering high-powered performance, robust power, expansive interior space, and a spectrum of safety and entertainment technologies, the 4Runner SUVs are perfect all-purpose vehicles for Georgia drivers, as you’ll see below. The 4Runner runs on a 4.0L V6 DOHC 24-Valve engine with Dual Independent Variable Valve-Timing with Intelligence and is able to produce out an unbelievable 270 hp and 278 lb-ft of torque. Yet at the same time, the 4Runner is one tough SUV, boasting a tough build as well as a selection of driver assist programs, like Standard Hill Start Assist Control and Downhill Assist Control, making off-road driving easier than ever. At the same time, the 2019 Toyota 4Runner gives you a Kinetic Dynamic Suspension System and Crawl Control for improved traction, and a choice of two 4-Wheel Drive systems. Finally, Multi-Terrain Select lets you choose from four different driving modes in order to ensure the best wheelspin for your driving and weather conditions. a 15-speaker JBL audio system to keep the music playing, whether you’re driving around the city or out on those long country roads. Whether you hail from Atlanta, East Cobb, Vinings, Smyrna, East Cobb, Roswell, Marietta, or beyond, you can arrange to rent one of these exciting new 4Runner trims simply by stopping by Toyota of Marietta, located at 750 Cobb Parkway South in Marietta, or giving us a call at 877-806-9150. Don’t miss this golden opportunity to explore the new 2019 Toyota 4Runner SUV! * High Season Rates Applicable March 31 – July 31. Rental Qualifications: All Drivers must be over the age of 21, Valid Driver’s License, Full Coverage Insurance (Comp/Collision) that includes Rental Car Usage (i.e., your insurance must transfer coverage), and a fully Refundable Damage Deposit of $250 if paying by Credit Card OR $350 if paying by Debit Card. A $50 Reservation fee, applied to the cost of your rental, is also required when reserving a vehicle in advance. No Credit Check Needed! Call us today at (678)398-4063 & make your next family vacation, or weekend getaway more enjoyable for everyone! *Manufacturer’s Suggested Retail Price, excludes the Delivery, Processing and Handling Fee of $900 for Small/Light trucks.